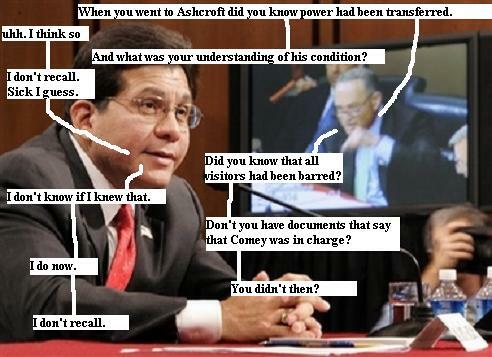 As you probably know, last week Attorney General Alberto “Torture Boy” Gonzalez got up before the Senate Judiciary committee led by Democratic Senator Patrick Leahy of Vermont, and Republican Senator Arlen “Single Bullet theory” Specter, and gave the most hideously dishonest, lie packed testimony ever uttered under oath in a public setting. The whole sorry scene was chronicled in our July 25th, comic called Torture Boy Takes The Stand. 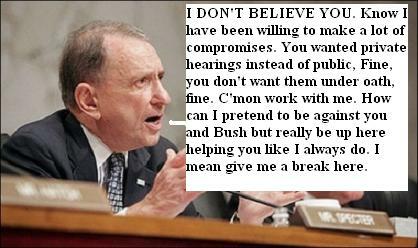 Old Arlen was up to his usual tricks at the hearing telling Gonzalez he did not believe him regarding the Attorney General’s testimony. We knew however that Specter was playing his usual game and pretending to be against Gonzalez while secretly working behind the scenes to cover up and obstruct on behalf of Bush. 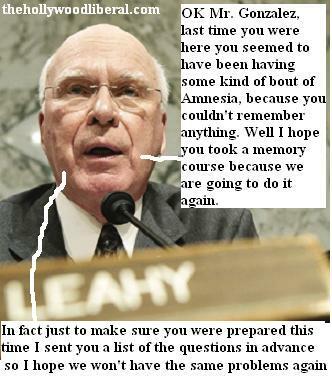 Leahy last week sent Gonzalez a letter offering to give him a week to “resolve any inconsistencies” in his testimony. Leahy does not currently support charging Gonzalez with Perjury. Yes you read correctly, The head of the Senate Judiciary Committee sat there while the Attorney General insulted his, and our intelligence over and over, and pretty much said to him ‘Yeah I’m lying, do something about it,’ does not support charging this weasel with Perjury. 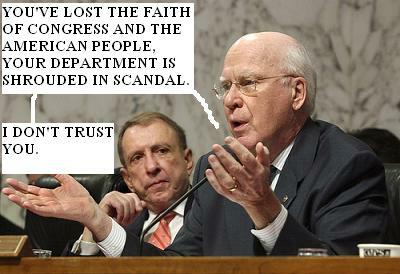 But, Leahy said, “that could change,” Yeah right. 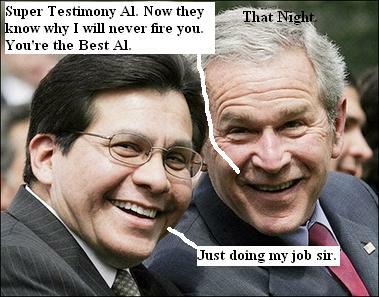 None of this really matters anyway because no way is Gonzalez going to change one word of his testimony, to do so would implicate Bush and the administration and that’s the only reason Gonzo still has a job, to keep the heat off Bush. So once Torture Boy does not comply with these new requests will Leahy and Specter change their minds and charge AG with Perjury? I’m willing to bet not. The whole thing is one big Dog and Pony show designed to make it look like they are doing something (Democrats and Republicans) to keep the voting public happy, when really all they are doing is lining their own pockets. HL’s Comics will keep abreast of the latest detail of this story and let you know what is really going on. This entry was posted	on Monday, July 30th, 2007 at 9:37 am	and is filed under Latest Stories & Articles by H.L., Main Blog (All Posts). You can follow any responses to this entry through the RSS 2.0 feed. Both comments and pings are currently closed. I was bored so I looked up liberal blogs for some humor. Your blog is awesome. Watching lunatics blather is hilarious. Liberal blogs are funny. Today is Al Gore quote day. How one know if a lawyer is lying? Aren’t almost all Congresspeople lawyers. As a class I have lawyers only slightly ahead of car salespeople and journalists. Reminds me of when Edwards blamed the Republicans for “tax cuts for the rich” in the 2004 elections. Edwards did the same thing himself. Edwards got some $18 million in the ninties, in a class action suit against the tobacco companies, declared himself a Chapter S Corporation, and paid those millions to himself as dividends at a much lower tax rate. What a liar. At least when Cheney set up those dummy offshore corporations, he was intellectually honest.